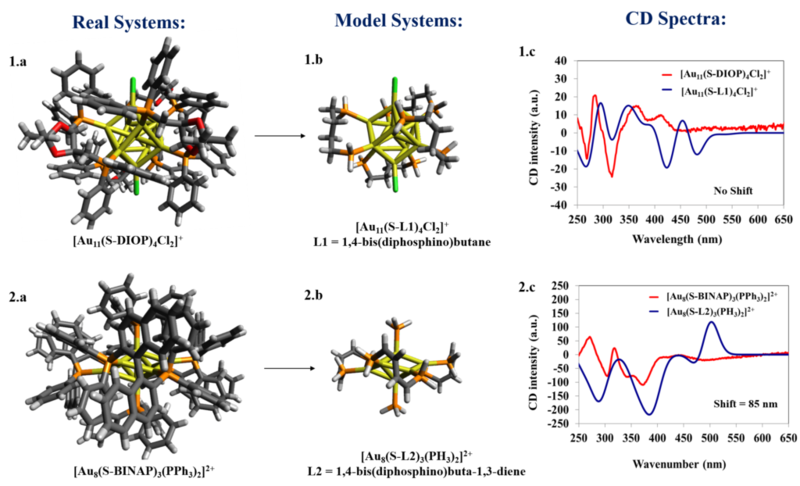 By running DFT and TDDFT calculations with ADF, Natalia V. Karimova and Christine M. Aikens could gain detailed insight into the origin of chiroptical activity and the effects of ligands in bisphosphine-stabilized gold clusters [Au11X4Cl2]+ and [Au8X3(PPh3)2]2+ (X = DIOP, BINAP). To reduce computational time, the original BINAP and DIOP ligands were substituted by small model ligands. These model ligands cut computational costs and allowed preservation of essential features of the systems of interest. Optical absorption and CD spectra were calculated for these model systems in gas phase and in chloroform. The authors showed that the theoretical optical absorption and CD spectra of the model clusters are in good agreement with experimental data. The deformations of the Au core due to ligation and the nature of the ligand were found to play the most important roles in the chiroptical activity of the considered gold clusters. Furthermore, it was shown that ligand connectivity determines the gold core structural geometries. The ligands themselves essentially affect the high-energy region of the CD spectrum, whereas the gold core yields a significant effect on the shape and sign of the CD spectra in the low-energy region with wavelengths longer than ~350 nm. Natalia V. Karimova and Christine M. Aikens, Chiroptical Activity in BINAP- and DIOP-Stabilized Octa- and Undecagold Clusters, J. Phys. Chem. C ASAP (2018).